Post #119 Poll Winner: Favorite Independent/Myspace band (2010). As you may already know, DEADMANSWAKE are a local band in the Chicago/suburban area that are making a name for themselves in the last couple years. They've been around for a few years, as early as '03, then called Dead Issue. They've also gone by the name Encircled before finally changing their name to DEADMANSWAKE. A couple changes in personnel over the years have solidified the band's creative core: JP Soule & Josh Barker on guitars, Troll on bass, and lead vocalist Kryssie Ridolfi. In the last couple years they've opened for the likes of Scar Symmetry, Eyes Set to Kill and A.D.D. as well as other female-fronted metal bands such as In This Moment and Epica. They were also featured in Chicago's Dame Nation and Dame Nation Redux shows (a multi-band concert that features female-fronted Chicago-area metal bands). 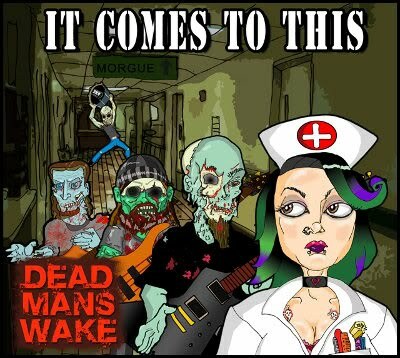 It Comes To This is the self-produced debut album from DEADMANSWAKE, the 2010 winner of this blog's myspace-bands reader's poll. After having a chance to hear this album in its entirety, let me say, WOW! This band delivers some great metal music! 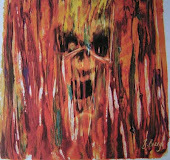 Their sound reflects strong influence from the classic NWOBHM and Thrash-metal scenes. Heavy riffs are the backbone of most of their songs, but they do change it up with plenty of melodic, clean-guitar passages here and there. Kryssie's bluesy voice keeps a melodic element at the forefront of the mix, delivered with great enthusiasm & emotion. Josh & JP trade back & forth on their guitar solos so smoothly you'd think they've been playing together for a decade. The drum & bass rhythm section keeps a heavy groove driving the music onward. 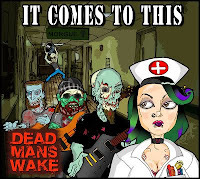 DEADMANSWAKE establish a trademark sound of melodic metal that's easy to sing along to, while still providing plenty of energy that lends itself well for emotional venting. This formula, combined with the immense talent that is aparent on this recording, leads me to say these guys will soon find themselves playing bigger & better shows if they stick with it. The band already have plans in the works for an EP of cover tunes. I can't wait to hear what suprises they have lined up for that project. For now, I'm quite pleased with It Comes To This. I also plan on seeing a few of their live shows over the next couple years. I hope many of you will do the same. From now until next year's Myspace-band reader's poll, I intend to keep promoting DMW's shows through this blog. Watch for these upcoming shows right here at happyheadbanger! Don't forget to visit the band's websites for streaming music, merchandise available for purchase, and upcoming shows!